Dr. Phoebe Zarnetske and colleagues have a paper in the Journal in Early View titled Indirect effects and facilitation among native and non-native species promote invasion success along an environmental stress gradient. Read the paper here. The authors have provided a short synopsis of the paper some great photos of the study site. Coastal dunes provide an important ecosystem service for humans – coastal protection from overtopping waves. Coastal dunes are formed over time as vegetation captures wind-blown sand and grows in response to sand deposition. Different vegetation species and sand supply conditions can lead to different dune shapes, and these shapes dictate the level of coastal protection. In the U.S. Pacific Northwest, sand supply rates and the shapes of foredunes (linear ridges aligned parallel to the shoreline) vary along the coast (Hacker et al. 2012). 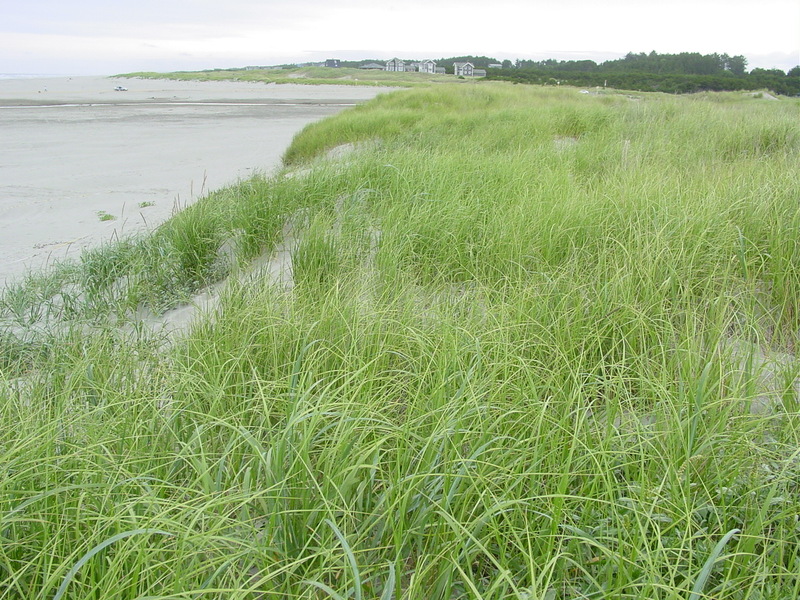 In the north, ocean-derived sand supply rates to the coastline are high, foredunes are low and wide, and the introduced, non-native beach grass from the U.S. East Coast, Ammophila breviligulata, is the dominant species. In the south, sand supply rates are low, foredunes are taller and narrower, and the introduced, non-native European beach grass, Ammophila arenaria, is the dominant species. Our previous research found that A. arenaria has a superior ability to build tall foredunes compared to A. breviligulata and the native beach grass, Elymus mollis (Zarnetske et al. 2012). The fact that A. breviligulata is largely restricted to coastal areas with high sand supply rates suggests that sand supply might restrict its geographic distribution. If it was introduced to new sections of coastline in the south, could it invade and take over? Given the differences in dune building capacity, future invasion scenarios could alter coastal protection ability via changes in dune shape (Seabloom et al. 2013). We conducted an experiment and collected field data along the coast to generate a numerical model that could address these questions. 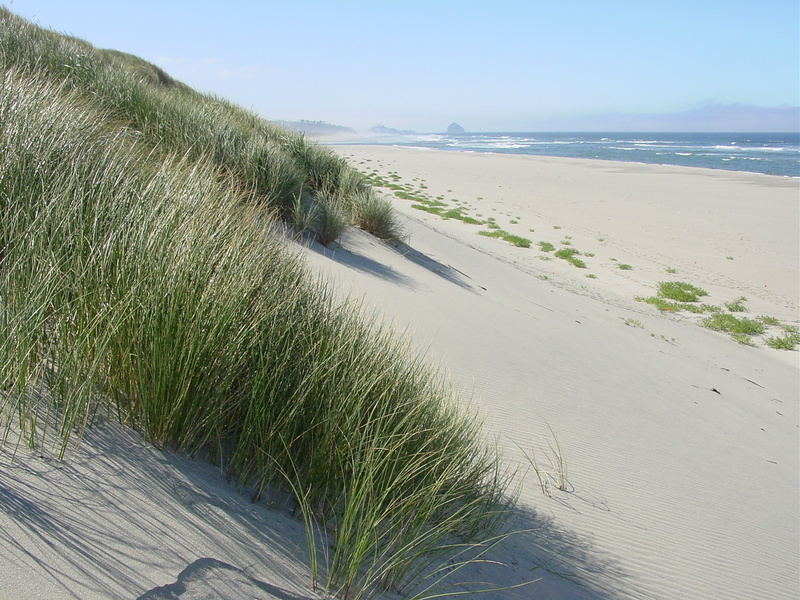 Our model shows that once introduced via natural or human means, A. breviligulata can invade and dominate coastal dunes across the range of sand supply conditions along the U.S. Pacific Northwest coast, including new areas in the south. In these southern areas with low sand supply rates, and where A. arenaria maintains taller dunes, our model predicts that the future invasions by A. breviligulata are more likely to result in co-dominance by both Ammophila species. This would potentially lessen a decline in dune height, and thus moderate the negative impact on coastal protection. 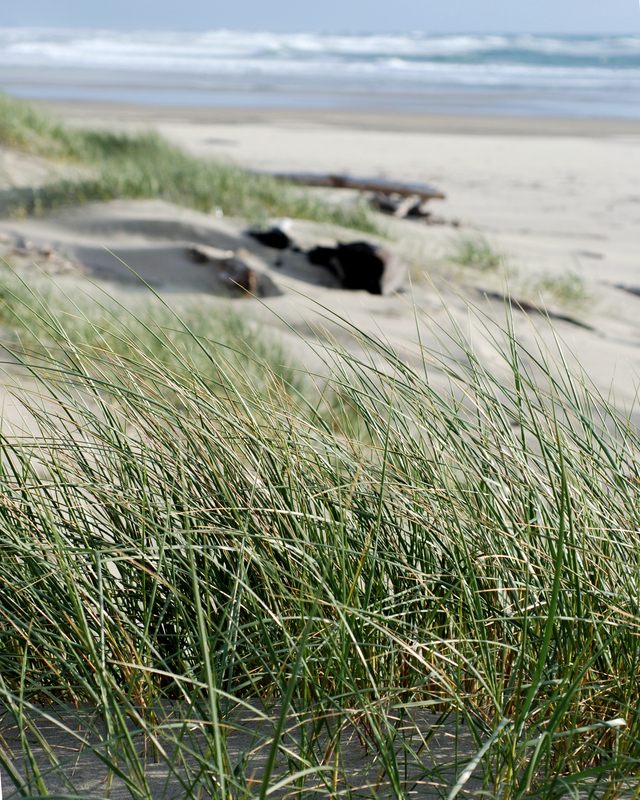 Over the long term, our model suggests that all three beach grass species are more likely to coexist on foredunes across the Pacific Northwest, and that only rarely would the native grass be excluded. Positive and indirect species interactions help promote this coexistence. It is especially important to understand mechanisms and implications of future invasions by dune building grasses in light of documented increases in storm wave heights, and predictions of sea level rise during climate change. 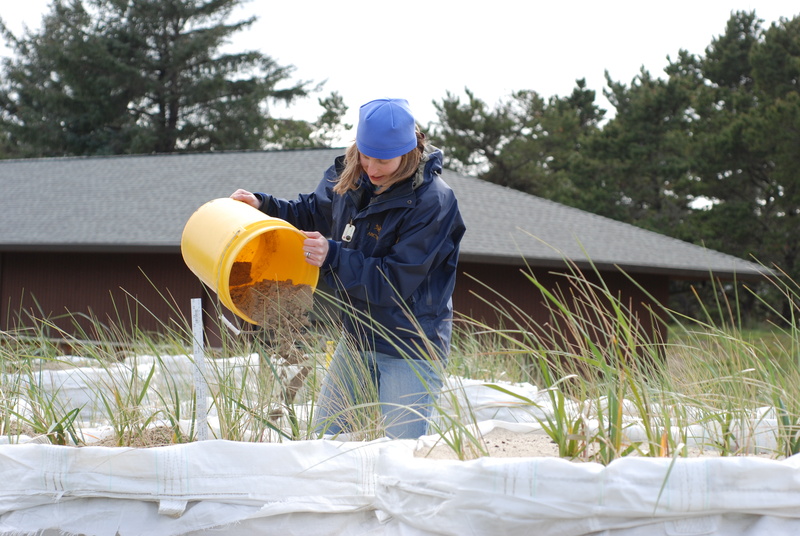 Our study provides this understanding and thus helps anticipate potential effects on the dune plant community and its ability to provide coastal protection services to humans. Hacker, S.D., Zarnetske, P.L., Seabloom, E.W., Ruggiero, P., Mull, J., Gerrity, S. & Jones, C. (2012) Subtle differences in two non-native congeneric beach grasses significantly affect their colonization, spread, and impact. Oikos, 120, 001-011. Seaboom, E.W., Ruggiero, P., Hacker, S.D., Mull, J., & Zarnetske, P.L. (2013) Invasive grasses, climate change, and exposure to storm-wave overtopping in coastal dune ecosystems. Global Change Biology, 19, 824-832. Zarnetske, P.L., Hacker, S.D., Seabloom, E.W., Ruggiero, P., Killian, J.R., Maddux, T.B. & Cox, D. (2012) Biophysical feedback mediates effects of invasive grasses on coastal dune shape. Ecology, 93, 1439-1450.